The latest prototype from Japan’s display giant, on show at CEATEC this week, is a touchscreen that can recognize not just two, but up to five different simultaneous inputs. The ‘system LCD with embedded optical sensors’ (for that is its name at present) achieves this by turning every single pixel of its 3.5in girth into an optical sensor. 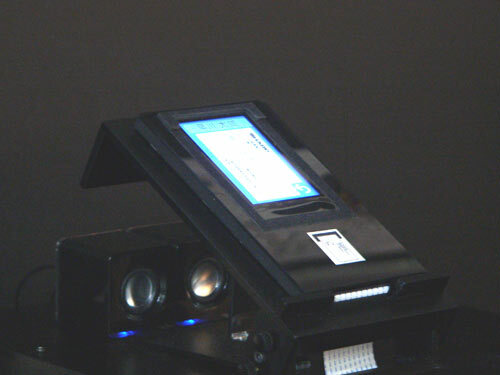 As you might guess, this means the screen can also be used as a flatbed scanner, which was demo-ed using a business card-reading application. Aside from providing enough sensitive points to almost keep an octopus happy, the new technology has the side effect of eliminating the need for a brightness-dimming, resolution-crushing sensor film over the glass. In practical terms, Sharp’s mapping application was a breeze to use with the usual pinching or stretching made more useful with, for example, a third tap to zoom in when fine-checking a point on the map briefly. A piano application was also fun, thanks to the ability to form proper multi-note chords. For now, apart from virtual pianos, it’s hard to see how five separate inputs could actually be used, but Sharp will surely find a way before the display is commercialized in 2008.